J Hagger Window Cleaning use the latest equipment and techniques for window cleaning as well as traditional methods. By using the latest “purified water pole system” our fully trained uniformed staff are able to clean the majority of windows from ground level, what is ed ensuring the highest level of “Health and Safety”. We guarantee to find a cost effective solution to any window cleaning task. We are proud of being able to offer a complete service which includes the cleaning of frames and sills at no extra cost. We offer cleaning programmes of 4, 6 or 8 weekly cleans. A fully insured window cleaning service for a fantastic finish, with 15 years experience and friendly staff who can also offer a range of other cleaning services to suit your needs. 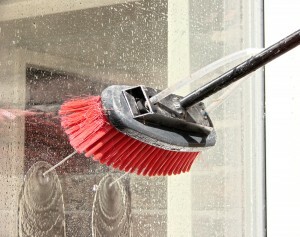 Our window cleaning coverage areas are North Devon and Bishops Stortford; Hertfordshire. J Hagger Window Cleaning is fully insured for peace of mind and protection of your property. We aim to provide a service you can have trust in. Call us today on 07787 368 684 or use our contact form and we can provide a no obligation quotation. At Enjoy The Views we offer both domestic and commercial window cleaning services, including houses, flats, shops, schools, offices and other residential and commercial premises. © 2016 J Hagger Window and Gutter Cleaning. All Rights Reserved.